It’s the first week in March, and I’m sitting at my desk which is situated in front of our study window, and watching the leafless trees swaying around in an enervating breeze. The snow has now gone, and the birds are starting to sing. They are no doubt thinking about building nests, and preparing for their next brood. I wish that I could see the first signs of tiny buds swelling and readying themselves to burst into full leaf. I have to confess that I’m not a winter person. I digress… I should be thinking about writing something, but what am I going to write about? Do I write another book, or another short story? I’ve just sent off my latest short story, which will hopefully be included in an Anthology. It’s all about a bonfire. Bonfires, you may ask? Well, it’s about November the 5th, and Guy Fawkes sitting on top of a pile of rubbish and waiting to be burnt. But I could equally well be spending a little more time on another story on which I’ve been working; this one is about a beach hut. What can you write about a beach hut? You can’t cook in one, and you’re not supposed to spend the night there either. What’s more, they now cost a fortune to buy! The most important thing you need of course, is wonderful summer weather which is sometimes in short supply. I try to picture my ideal beach hut in my mind. I will call it THE REFUGE. It will sit alongside five other beach huts. Each one is painted a different colour and surrounded by a low white picket fence. But I can’t make everything perfect, can I? There has to be conflict of some kind, or it would be a little boring. So this is where the fun begins. As a writer, you can imagine all kinds of problems. The trees outside my window are now swaying in a really strong breeze. and the clouds are scudding across the sky. My brain immediately conjures up a raging sea, which is gradually sending up huge waves… will they reach my hut? The possibilities are endless. I’ve also just finished a tale which I’ve called A TANGLED WEB! The protagonists in this story call themselves “THE BLACK SPIDER’S WEB”. There again, my mind immediately thought about MI5 (or would it be MI6?) spies and danger. Such fun. Receiving reviews makes an author feel that all the effort and worry about producing a book that someone wants to read, is worthwhile. I’ve received some 5* reviews for all of my books. I published WHEN THE ICE MELTS through Matador in 2016 and two of the reviews made me smile. I’m sure that there couldn’t be two shorter 5* reviews in existence: one said “Mesmerizing”, and the other, “Spellbinding”. I’m still sitting at my desk and occasionally glancing out of the window. A squirrel is using the branches of the trees as a fast “highway”. as he progresses from one to another. Human beings can’t possibly do the same, but we do have the ability to write about what we think and see, and enjoy doing. But… whatever book you read, whether it is non-fiction, or one of the many genres of fiction, please think about the author, and give them a review. Don’t get me wrong, to receive a 5* review is wonderfully gratifying, but any review is better than no review at all. We hear a lot nowadays about “ICE”. What exactly does the word mean and why is it so important in our lives? But does it always mean the same thing? Everyone knows that ICE is a liquid that is frozen, but it can melt. We are constantly being told that global warming is happening right now, and that the polar ice is melting. Are we sure that this is all our fault, or is it part of the earth’s ever-changing climate over millions of years? Having said all that, it is so important to know what sort of ice we are dealing with. We have all heard of someone having an ICY MANNER, but what happened to make them act in this way? This attitude can cause problems, particularly in personal relationships! So, what happens when this ICE MELTS? In my book WHEN THE ICE MELTS, potential readers may think that it is yet another story about Global Warming, but this couldn’t be further from the truth. As a writer you are often trying to think of an interesting story to tell. I read an article about a woman whose son was in a long-term coma with no chance of a recovery. It quite upset me, and I began to wonder what it must be like to be in such a situation. I couldn’t stop thinking about it, and so… WHEN THE ICE MELTS was born. Solicitor Tom Wenham is severely injured in a plane crash in Switzerland, which leaves him in a coma. Several months later, his wife, Sarah, is told that her husband’s condition has deteriorated and that there is no brain-stem function. The consultant looking after him, informs her that he needs her authority to have his life support machine switched off. Sarah loves Tom so much, but she eventually relents and gives her permission. After his death, she finds it impossible to believe or understand what she has done. She cannot forgive herself, and tries to protect her emotions by building a thick wall of ice around her heart, thus cutting out the outside world. Should Sarah be condemned for making such a decision? Would you be able to do something like this, yourself and not feel guilty? This moving romantic novel has a thrilling edge to it. 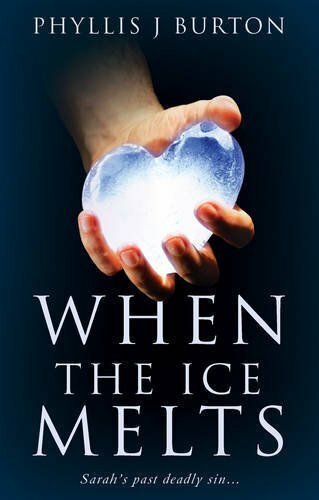 In order to achieve a happier future, Sarah is involved in a roller-coaster of enormous proportions, until the ice in her heart eventually melts, and she finds true love again. Find this story on: http://www.phyllisburton.com and also AN INTERVIEW WITH SARAH WENHAM). Source: Do you love Writing…? When I first thought about the subject of my next book, my mind was filled with questions. Who is the main character in this story? What will happen to her? I had the bare bones in my mind, but as a writer you have to put flesh on them in order to gain a reader’s attention. I was told at Creative Writing Classes that you have to write about and describe ‘rounded’ characters: they have to be believable; they have to have problems, or conflict of some kind. But they have to be likeable, law abiding (well she would have to be because she was a solicitor), stiff and starchy when needed, but able to enjoy life to the full. In my mind, my heroine was Mrs. Sarah Sensible. She was a solicitor (or a lawyer to my American readers). Yes, she was very attractive, slim and in her mid-thirties, and married to Tom Wenham, also a solicitor. Some time ago, I read about a “Character’s Interview”, so here is my version. I will set the scene for you. Sarah and I are sitting at an old wooden table in the garden of the local pub and I have a piece of paper with several questions written on it, to which I’m dying to know the answers. Author: Hello Sarah. This is a “getting to know you” interview. Are you happy to tell our readers a little about yourself? SARAH: Hello. Yes, although I am a little reluctant to have you delve too deeply into my mind. It has been quite a hard time for me. Author: I do appreciate how you must feel. It must have been extremely difficult for you. Firstly, can you tell us a little about yourself and Tom, of course? SARAH: Yes, well… it was my first day at Law School, and I was feeling a little nervous, and… I was introduced to Tom. He was young, handsome, intelligent, and we hit it off immediately. It may sound improbable, but we sailed through all the studying and exams together. About a year after we qualified, we decided to get married: we were very much in love. Author: Your father was a solicitor too, wasn’t he? SARAH: Yes. He had started up a law practice several years before. It was a big step to take, but Tom and I decided to join him. I have my father to thank for my enthusiasm for anything to do with the law and helping me to become a more rounded person. SARAH: Yes of course. He was amazing… utterly amazing. Not only was he intelligent, but he was… he was wonderfully open. His knowledge of the law was infinite, and Tom and my father would often talk for hours about every conceivable aspect of the law. Oh, but don’t run away with the impression that I was a disinterested party; quite the opposite. Then my father died. I loved Tom dearly, so I was quite happy for him to be an equal partner in the practice. Author: I know this is painful for you, but you must have been unimaginably distraught when you learned about his accident. How did you cope? SARAH: I don’t really know how I coped really. I was living and thinking like an automaton. Nothing seemed to matter anymore. I was sitting at home waiting for him to return from a conference in Geneva, when I heard the telephone ringing. I had no inkling of the disaster which was about to unfold. The small aircraft in which Tom was travelling, crashed and he sustained injuries which were so serious that it seemed impossible for him to survive. He was in a coma, you see. Author: Can you describe your feelings while he was in a long-term coma? SARAH: My feelings were complex. How could you sit and watch the man you love more than anything in the world, struggle to survive? I couldn’t eat, sleep or work properly. My mind was totally fixed on waiting for him to wake up again. Author: What was it that made you agree to end his life? SARAH: I knew that I really had no alternative but to let him go. Once there is no brain-stem activity, life is impossible. Half of me wanted to scream “NO”, but the other half argued with me. It was an horrific battle. “THOU SHALT NOT KILL” screamed at me. But it was no use. Tom, the man I loved so dearly, was no longer a living sentient being and never could be again. Author: Then what happened, Sarah. Author: I know this is a really difficult question to answer, but how did you feel afterwards? SARAH: Numb, grief-stricken and so terribly guilty. In fact my heart felt like a solid lump of ice. Author: Can you tell me exactly how you felt when the ice melted? SARAH: How long have I got to answer such a question? Author: As long as it takes, Sarah. Thank you for being so candid. #8 – Yay For Family! I’ve only gone and got myself some cash! Things have taken a dramatic leap forward in terms of the first film for The Fear trilogy, Killer Bird. Since January I have managed to save up roughly £600 for the project from my own pocket, which is not nearly enough – nowhere near. Not even enough to tentatively start casting with the hope I save another £600 by the time we start shooting – knowing that I can afford to for at least food and travel expenses. Whilst I was doing all I could do ready myself for eventually being ‘ready,’ if I was honest with myself, I may have been able to start one project this year, but definitely not until much later on in the year. Not until I spoke to my Dad.